Application to make it easy to configure several advance Microsoft Windows IPv6 settings. 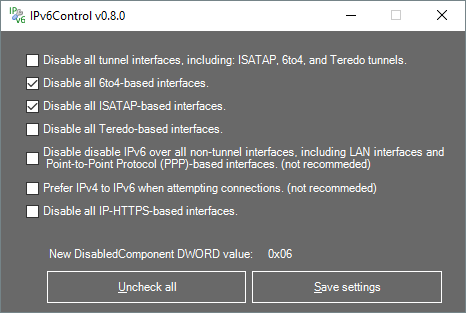 IPv6Control is a portable application to allow to enable or disable several IPv6 transition technologies in Microsoft Windows. Normally to disable these IPv6 transition technologies the Windows registry has to be used or a Microsoft Windows Fix-It. But with this application it's easy to disable the IPv6 transition technologies by just using checking several checkboxes. IPv6Control is one application that can be used to do the same as all eight Windows Fix-It's applications listen on KB929852. Application now requests required administrator rights on startup. Fixed getting message Object reference missing(..) on startup if registery value did not exists. Now loads and displays current settings on startup. Set minimum resize size of window. Display missing administrator rights warning when reading or writing the registery value failed due to insufficient permissions. If you found a bug please open a issue. IPv6Control is created by @D9ping. IPv6Control is maintained by D9ping. This page was generated by GitHub Pages using the Cayman theme by Jason Long.